Florida Governor Ron DeSantis' wife Casey took part in releasing over two thousand redfish, to help restock the species so important to Florida's fishing economy. The redfish population was devastated by 2018's extensive red tide. Florida Governor Ron DeSantis's wife Casey took part in releasing over two thousand redfish, to help restock the species so important to Florida's fishing economy. The redfish population was devastated by 2018's extensive red tide. Florida's First Lady was joined by Florida Department of Environmental Protection Secretary Noah Valenstein in attending the red tide recovery event at the Isles of Capri Paddlecraft Park on Friday. 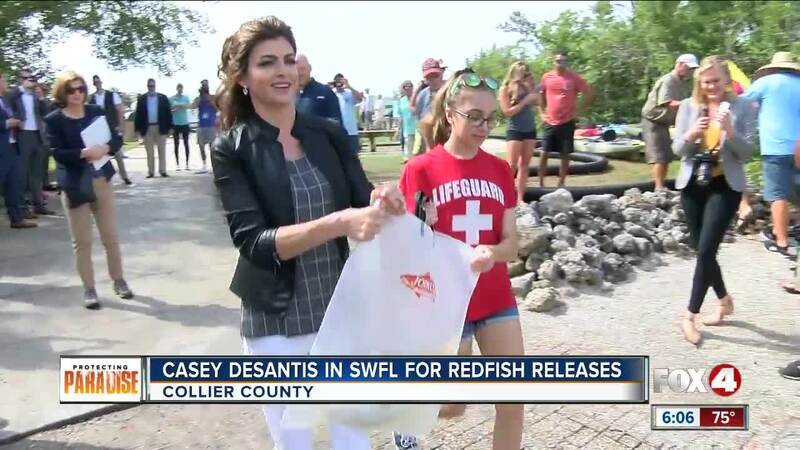 Casey DeSantis helped to carry several adult redfish to the water in plastic water-filled bags. "This is for the future of our state," DeSantis said. "The water really is the lifeblood of so much." The shoreline release of redfish was part of an ongoing effort between Duke Energy, Coastal Conservation Association of Florida, and the Florida Fish and Wildlife Conservation Commission to release over sixteen thousand hatchery-reared redfish in Gulf coast counties impacted by red tide. Jake Pappas of Paddle Marco leads kayak fishing tours from the Paddlecraft Park. He said that anglers have been hooking fish such as snook, sheepshead and tarpon, but redfish have been hard to find. "Not a lot of tours have been getting booked," he said. "So not a big influx of people coming down this year, because they saw all the news on the red tide." He said that since redfish are such an important species to the local fishing economy, he's encouraged by the release of thousands more into the waters where he works. "It should re-up the population," he said. "Their livelihood on the water, when it comes to fishing, boating and recreation is in jeopardy," DeSantis said. "We've got to get it right for them."